This book is written to help adventuresome motorcyclists buy, ride, and enjoy dual sport motorcycles, those versatile machines that are equally at home on the street and in the dirt. It is organised into four sections covering motorcycle selection, set-up, riding skills, and specialised activities such as off-road touring and rallies. Several chapters include exercises designed to improve riding technique and impart new skills. 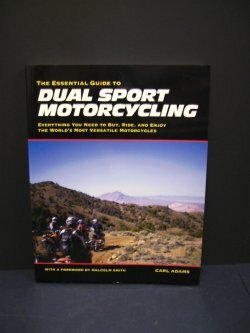 Over 250 full-colour photographs illustrate the many options for gear, clothing, and after-market accessories which can add comfort, safety, and convenience to any motorcycle adventure.The book also contains many references and sources to orient enthusiasts to the sometimes overwhelming sea of information that is available. New riders will benefit from the clear explanations of dual sport gear, accessories, and techniques, while experienced riders coming to dual sport from a street riding background will find chapters covering advanced dirt riding skills, GPS navigation, and preparing for multi-day trips. All terms are explained and riding techniques are described in detail. Riders at all levels will gain a broader perspective of the dual sport experience, from which they can begin their journey to new motorcycle adventures. 192pp.